Venice (Italian: Venezia) is a city on Earth, and is located in Italy. It is well-known for being built over a series of small islands, and is home to numerous canals. 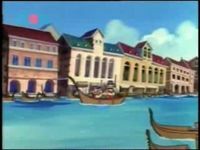 Venice is featured in The Adventures of Super Mario Bros. 3 episode "The Venice Menace". Kootie Pie Koopa wants her own waterpark, so Bowser gives in by promising to warp the entire city of Venice to Dark Land. However, before Bowser can warp the city, he has to scare everyone away with the Doomsub. Mario and Luigi travel to Venice to fight Bowser, and while they are there, Mario feels a strange feeling in his bones. After finally vanquishing Bowser, a gondolier introduces them to the statues of Marco Polo's Plumbers in the heart of Venice. Because Mario and Luigi are descendants of the plumbers, Mario is uncontrollably attached to the city of Venice. Venice also appears on the Globulator, a world map seen in the SNES version of Mario is Missing! Mario Party 7's gameboard, Grand Canal, has similarities to Venice. This page was last edited on August 17, 2018, at 23:11.